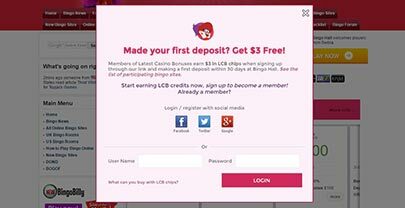 Earn LBB Chip rewards for making your first deposit at participating online bingo sites. Are you ready to get started? Simply select any of the brands below, make your first deposit and claim your chips, which may be used to purchase any of the items displayed in the LCB Shop. Participating brands will also be indicated with a pink LBB Chip symbol on our Bingo Rooms list and on corresponding review pages. New sign-ups or players who have previously registered via the LBB link will be eligible to earn rewards for their initial deposit whether claiming a standard sign-up bonus, LBB Exclusive Welcome Bonus or making a straight deposit. IMPORTANT TIP: before signing up make sure you clear your cache and clean your PC cookies before clicking our links to sign up, this will ensure you are linked to LBB and get rewarded for making a deposit. Earning 1st time deposit rewards is easy. 1. Select a participating brand. 2. New webpage will open where players will register/login to the bingo site. 4. Return to LBB page and enter bingo username in the claim form. 4. Return to LBB page and you will be prompted to sign in or register. 5. Once signed in or registered, return to here to Participating Sites. 6. 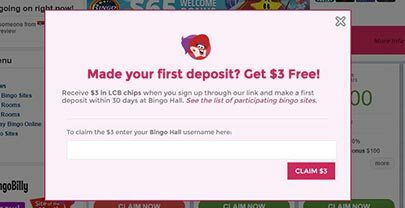 Enter bingo username in the claim form and 'Claim $3'. Please be sure to enter user names exactly as they appear on the bingo site so we can verify your deposit with the operator as quickly and efficiently as possible. Once submitted, your claim will be forwarded to our LCB Shop Rewards department and when your deposit and eligibility are confirmed we will credit your member accounts with rewards. 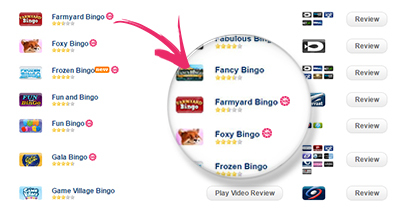 We strive for quick verification times but these may vary depending on confirmation from the bingo operators. Enjoy earning LBB Chip rewards in a variety of ways, which now includes first time deposits! Warning : No multiple accounts allowed. If we learn that you have multiple accounts at LBB or at any of the participating bingo sites, you will be disqualified and restricted from our site.